The second I laid eyes on these shoes, I thought how much they reminded me of the very first collection of Vivienne Westwood for Melissa ‘Lady Dragon’ shoes. The baby blue and red shoes from that line have always been one of the “ones that got away” for me: I absolutely loved the colour combination, and really wish I’d bought a pair when they were released, but c’est la vie! 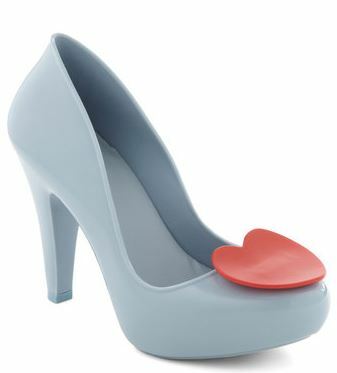 Unsurprisingly, then, these shoes are actually by the same brand: Mel is Melissa’s slightly lower-priced diffusion line, and these obviously draw inspiration from the original Lady Dragons, both in terms of the colours and the hearts. 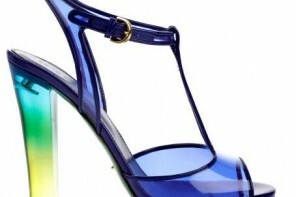 The shape, meanwhile, is the one used on Melissa’s “Skyscraper” pumps, which I’m sure fans of the brand will be familiar with. So, what do you think of these? My guess is that if you loved the Lady Dragons you’ll at least like these, although they lack the elegance of the peep toe style. (For most people, I think the main attraction of the Lady Dragon shoe is the embellishment on the toes, but I also think the narrow shape of the shoe underneath is very flattering, and lovely in its own right.) If you’re in the camp which shudders at the very thought of plastic shoes, however, you’ll probably be less enamoured with these, and I definitely think they’ll be harder to wear than their peep-toed sister, mostly because they look a little bit like toys – or is that just me? 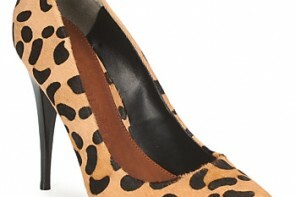 At the time of writing, these aren’t yet in stock, but they’re due in soon at Modcloth, where they’ll retail for $74.99. yes they look so much more like toys than the original ones ! I’m waiting for the Melissa’s by karl Lagerfeld ! I like the colour but not the plastic. I love them! I might even get a pair for myself since lady dragons are hard to find in the states (so few options and colors).